Baltimore Traction Co. Car 554, A story in pictures. The Baltimore Streetcar Museum has a goal of preserving a collection of historic Baltimore transit vehicles for the future. 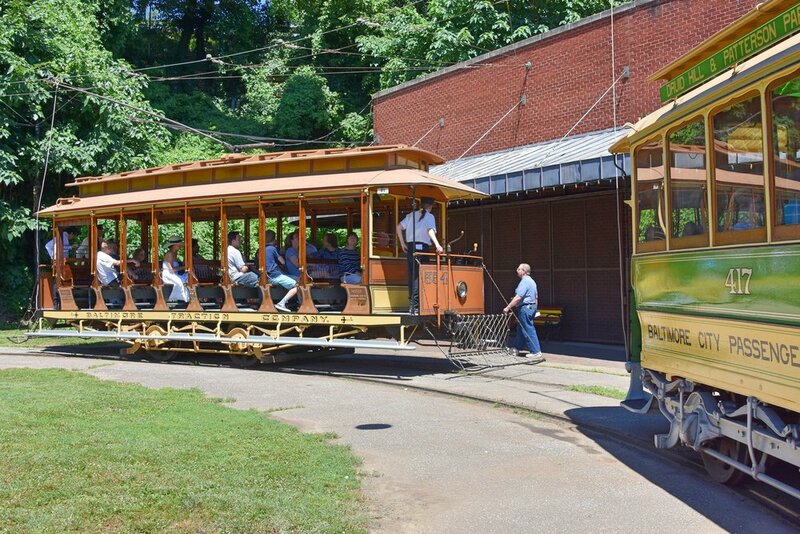 These street railway cars were designated for preservation in the late 1920s by the United Railways and Electric Company of Baltimore. Although the scope of the collection has grown to include non-Baltimore vehicles, the mission remains the same: preservation. 554 is one of 135 cars purchased in 1896 from the Brownell Car Company of St. Louis, Missouri. Upon delivery, it provided summer service on the lines of the Baltimore Traction Company, and later provided the same service for the Baltimore Consolidated Railway and the United Railways and Electric Co. 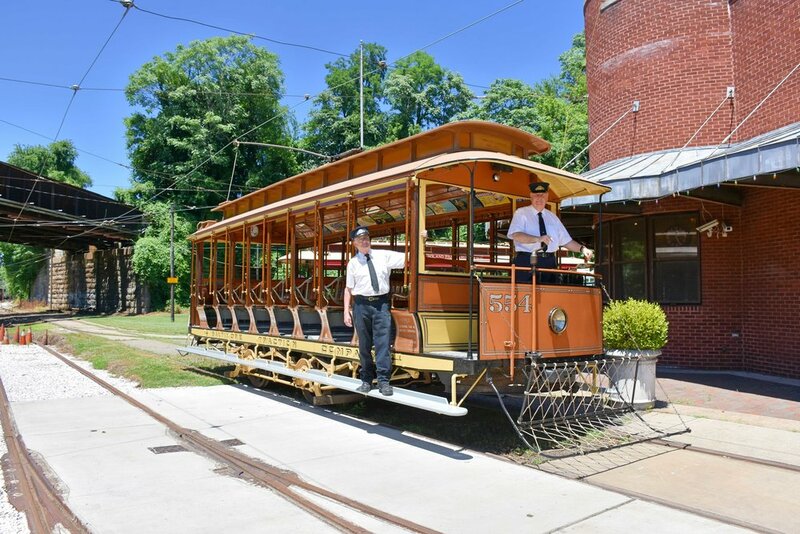 It is one of the few surviving open cars in the United States, and the only surviving open car built by the Brownell Car Co.
554 saw previous service at The Baltimore Streetcar Museum after a 1970's era cosmetic restoration, but even with limited use, its age began showing, and the museum was forced to withdraw it from service several years ago pending a structural rebuild. That rebuild is now completed, as of June 2018, insuring the car's survival for future generations to appreciate and enjoy. 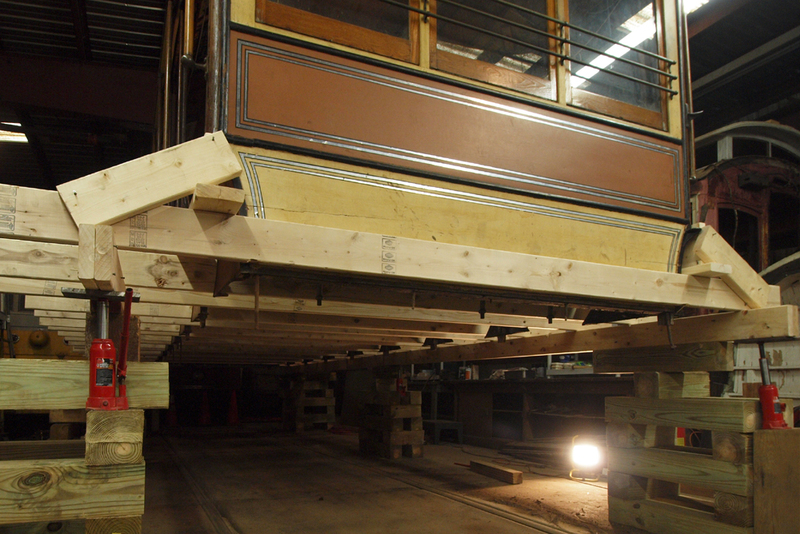 The following photographs provide an overview of the work completed and provide a sense of what it takes to restore a streetcar. 1. First, the car was prepared by BSM volunteers (Ed Amrhein and John LaCosta, in these photos). 2. Running boards and other parts were removed to allow the car's superstructure and floor to be separated. 3. The superstructure was then lifted, without disassembly, from the deteriorating frame with the aid of blocking and jacks. 4. Next, with the floor and frame supported on jacks, the car’s truck was disconnected and rolled back under the suspended superstructure. 5. New wooden side sills along with the side steel plating could now be fabricated and installed by our contractor. 6. New wooden side sills along with the side steel plating could now be fabricated and installed by our contractor. 7. The car’s truck, now completely free of the car, was power washed and treated with rust reformer by museum volunteers prior to repainting. 8. After the frame was renewed, the truck, roof and seats were reattached to the car's floor. 9. 554's much needed facelift included: parts-cleaning, repairs to cracks in its wooden body panels and a fresh paint application. 10. Museum volunteers provided many hours of manual labor to make the car both safe to operate, and attractive to look at. Justin Thillman fabricates a new wiring harness in this photo. 11. Windows were renewed by Abe Zumwalt. 12. Attention to the monitor roof was a major project. This involved removing the clerestory windows in order to strip the paint from the exterior framing and roof overhang. 13. After refinishing, the window glass was reinstalled using newly milled window beading, returning the car to its 1896 appearance. 14. A new etched window, installed in the middle of the monitor end, now identifies the car’s builder: Brownell Car Company of St. Louis. 15. Next, the roof was cleaned and painted with imported Swedish linseed oil paint. Dave Wilson and Buster Hughes work to insure a waterproof seal in this photo. 16. In the interior, a long lost ornamental electric-kerosene chandelier was installed in the original position. The BSM was lucky to have obtained one of these fixtures several years ago. 17. 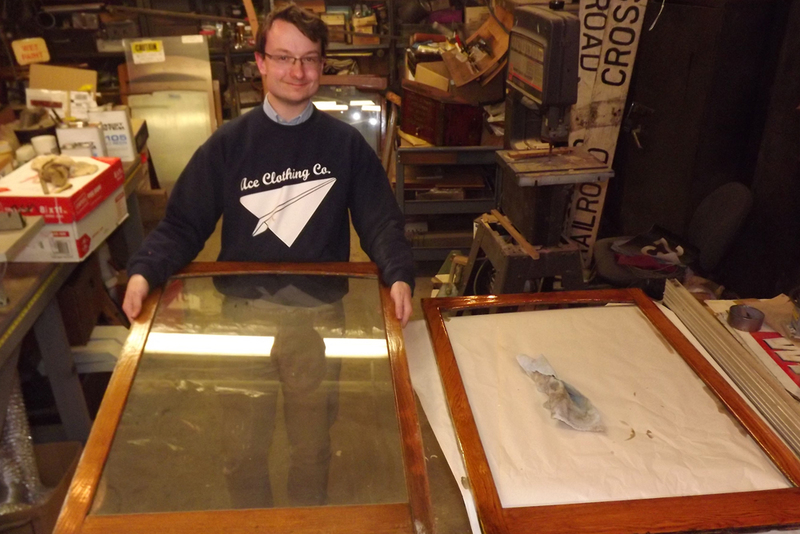 Another large task was the reinstallation of folding running boards. The project involved design and fabrication of the folding hinge and supports, as well as diagonal bracing to insure stability. 19. With parts cleaned, cracks repaired, and a new electrical harness installed, the car was reassembled and painted. 20. No painting detail was ignored. 21. Car lettering and numbering, along with other stripes and decorations, were designed and applied after painting. 22. Car numbering for car 554. 23. 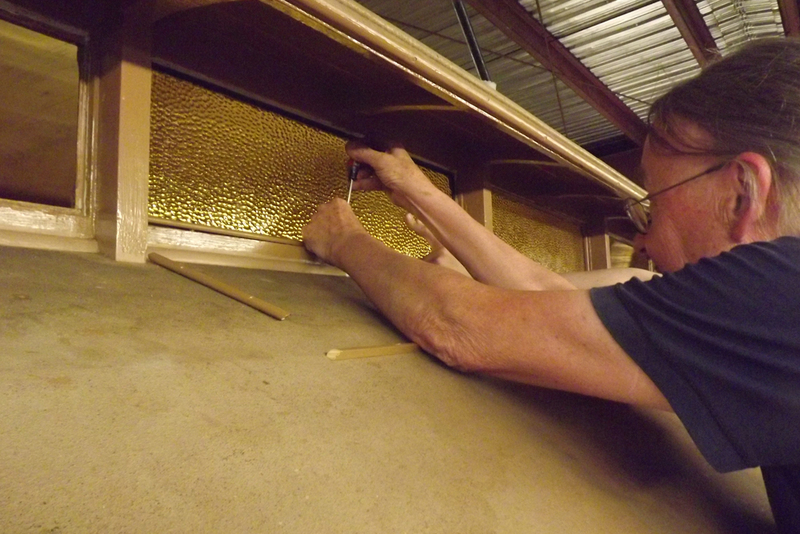 Truck renewal included the installation of new truss rods and newly cast truss rod supports. Here, Mike Barron and Gary Fairbanks machine the ends of the truss rods prior to installation. 24. Seats, and their reversible backs, were sanded and refinished. 25. A real find was an original fare clock of the correct vintage. Here, with its newly designed and fabricated face plate, the clock is shown installed above the end windows. 26. New fender mounts were fabricated based on historical photographs and now support reinstalled rope fenders. 27. Front fender mount in place. The completed project is the result of the combined efforts of many BSM volunteers. We thank them all for their hard work. This restoration was funded, in part, by a generous grant from the Baltimore National Heritage Area. We thank them for their support of the Baltimore Streetcar Museum.